Mystery seems to be a marketing point for In & Of Itself at the Daryl Roth Theatre (...well, that and the fact that Neil Patrick Harris is the executive producer). The name of the show is vague, if not forgettable and ungooglable. The elevator pitch is murky, promising that “new ways of seeing the unseeable are explored” and “secrets imagined for tomorrow all blend together.” However in reality, the show is easily summed up like this: exploring themes of identity, a genius magician dabbles in a non-linear one-man show format, which works sometimes but not others. The illusions, however, will definitely blow your mind. Derek DelGaudio, an award-winning magician, is the understated lead with deceivingly boyish looks. One might even mistake him for an average bro if they met him on the street, and actually, DelGaudio might be doing that on purpose. Being “invisible” was all part of his training. In reality however, he is an extremely dedicated magician with a bit of a dark side, which may stem from his difficult childhood. In In & Of Itself, he unravels bits and pieces of this personal story through a handful of monologues, as well as the folk tales that inspire his illusions. I won’t deign to describe DelGaudio’s tricks and ruin them for everyone. The fun lies exclusively in the room. A few hints though: there’s a lot of audience participation, clever lighting, and some impressive psychic prowess. Most of the payoffs extend well beyond your average magic show; in fact, they are sometimes deeply emotionally moving. These are not simply stunts for kids that leave you wondering how the f*ck did he do that? !—although I did say that a lot, and make no mistake, getting deliciously duped is a big part of it. 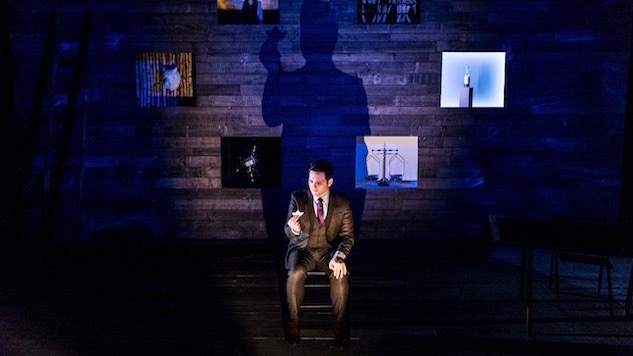 But, what makes these illusions feel all grown up is that they are lush and meditative, capping off each of DelGaudio’s monologue segments with a stunning, connective climax. The Mark Mothersbaugh score certainly helps, as does the interactive set design, which is presented like a tour of DelGaudio’s brain. On the heels of a sold-out run at the Geffen Playhouse in Los Angeles, In & Of Itself boasts a very impressive production crew between Harris, Mothersbaugh, conceptual artist Glenn Kaino and director Frank Oz (who played the voice of Yoda in Star Wars, among many, many other things). I felt guilty for wishing DelGaudio would stop talking sometimes and do more magic, as if I was rooting for a pop singer to belt out his big hit when he desperately wants the audience to take his new folk album seriously. The truth is though, in addition to the illusions being more fun, DelGaudio is clearly more at home doing them. He owns every moment when he is cracking jokes on the volunteers, feigning screw-ups, and skillfully distracting the audience while God-knows-what is happening under everyone’s noses. These moments cut through the hifalutin stuff to reveal a much more relaxed, consummate professional DelGaudio. Yet, these moments are lean overall in the 75-minute show. The connective thread seems to be rooted in the idea that identity is an illusion, which certainly adds up. Even after all the formative anecdotes, DelGaudio remains a puzzle until the bitter end. So does the play itself, which doesn’t seem to have a beginning, middle, end, or boundary between the stage, audience, or the street outside. We’re left unsure how to feel about DelGaudio—is he the “wolf” intent on maliciously messing with us, as he hints in the show? Or is he the benevolent trickster who crops up with a card trick from time to time? Does it even matter? Members of the audience are also asked to ponder who they are, how they want to be perceived, and who their neighbors are. (Whatever! More tricks please!) It’s unclear what you’re ultimately supposed to draw from this theatrical fog, but you’ll definitely leave the theatre very impressed, with a hefty dose of warm and fuzzies.